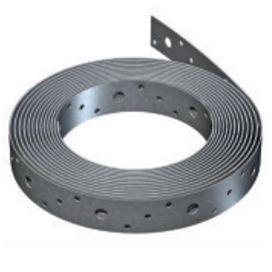 Expamet Fixing Band is an easy-to-use coil strip designed for all types of light fixing applications. Design Features • Manufactured from hot dipped galvanized mild steel to BS EN 10346 : 2009 DX51D + Z275. Installation Requirements Fixing: use BAT 3.75 x 30mm long square twisted sherardised nails, screws or bolts. Not to be used below ground. We stock a comprehensive range of quality building materials enabling us to offer the best value and service to our customers whether they are National Contractors, Local Builders, Self Builders or DIY Enthusiasts.